AN-PON-AGG-1U is a PON aggregation extender developed by AD-Net. It supports 1+1 dual power backup (AC220V/DC48V mixed application). AN-PON-AGG-1U support for WDM cards, and supports for hot swap. Support through the in-band management channel using the company's NMS3000 integrated network management platform for remote management , AN-PON-AGG-1U is with strong management capability and user-friendly interface, supports in-band network management, rapid configuration and setup for easy network maintenance and management. Supports general management on SC card. Supports configuration management, alarm management, performance management, fault management etc. for PAE service card. Supports processing and forwarding synchronization information internally. Supports monitoring and management on FAN and Power supply. Supports 8-channel GPON / EPON aggregation. Supports multiplexing / de-multiplexing between PON signal and ODU2. GPON mode: supports 4 x GPON signal multiplexed into 1 x OTU2, up to 8 x GPON signal generated into 2 x OTU2 per card; The OTU2 interfaces are independent. EPON Mode 2: supports 4 x EPON signal multiplexed into 1 x OTU2, up to 8 x EPON signal generated into 2 x OTU2 per card; The OTU2 interfaces are independent. Supports PM, SM overhead processing on the line-side interface, support TTI. GPON mode: supports 1+1 protection for 4 x GPON signals. EPON Mode 1: do not support line protection. EPON Mode 2: supports 1+1 protection for 4 x EPON signals. Support 3R function for PON port. Downlink: supports alarm monitor for GPON OLT downstream interfaces on client side; supports ODU1 de-mapping for GPON downstream signals on ONU side. Uplink: supports alarm monitor for GPON ONU upstream interfaces on client side; supports 1.244G <->ODU1 mapping on ONU side. Supports overhead processing for PM layer. Downlink: supports alarm monitor for EPON OLT downstream interfaces on client side; supports ODU0 de-mapping for EPON downstream signals on ONU side. Uplink: supports alarm monitor for EPON ONU upstream interfaces on client side; supports 1.244G <->ODU0 mapping on ONU side. 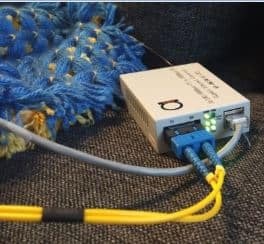 GPON Mode: supports 2 independent GCC0. EPON Mode 1: supports 1 GCC0. EPON Mode 2: supports 2 independent GCC0. GPON mode: supports GPON range proxy, supports GPON leading compensation. EPON mode: supports EPON idle compensation. Supports alarm monitoring and alarm management, such as alarm suppression, alarm reversal, alarm shielding, and so on. Supports PM and PM monitoring, such as zero suppression performance, current performance, and historical performance and so on. Scenario 1: for the local-side OLT centralized management, point-to-point network. The local PAE has a lot of PON Ports need to aggregation extension to the remote, the remote-side also requires a large number of PON port for PON network. Scenario 2: Applicable to the local OLT centralized management, Local-side has a lot of PON Port at the end of the aggregation extension to the remote-side. Data traffic is relatively small, and more decentralized. The distant end has to have an indoor room. Scenario 3: Suitable for the local-side OLT centralized management, requires much PON port aggregation. The remote data traffic is relatively small, and more decentralized, no indoor room, it can only be installed in the outdoor environment. Scenario 4: applies to the central office PON port is relatively small, point to point network, It can be aggregated far to the far end. AN-PON-AGG-1U is a PON aggregation extender developed by AD-Net. It supports 1+1 dual power backup (AC220V/DC48V mixed application). AN-PON-AGG-1U support for WDM cards, and supports for hot swap. 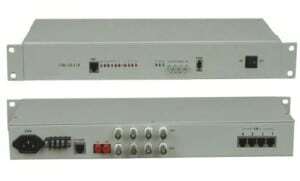 Support through the in-band management channel using the company’s NMS integrated network management platform for remote management , AN-PON-AGG-1U is with strong management capability and user-friendly interface, supports in-band network management, rapid configuration and setup for easy network maintenance and management.